Great oceanview 2nd row home. 2 minutes to the beach. Beach access is directly across from the house. 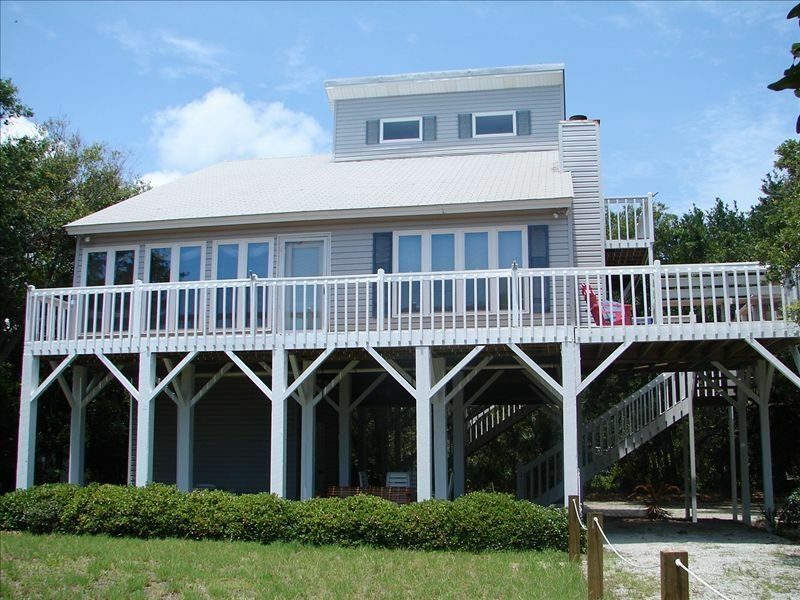 Located right across the street from the beach, there are good ocean views... plus a first floor spacious deck. On the first floor, there are 2 bedrooms with queen beds with each having their own private bathroom. A large living room with Premium Cable TV , a dining room with seats for 8 people as well as a 4 stool bar lies adjacent to the well stocked kitchen with new refrigerator! Also on the first floor, enjoy the nice glassed porch, off the living area with really good ocean views or you may want to sit on the front deck. The second floor boasts a third bedroom with a queen size bed . Additionally an open loft with two twin beds (great for kids!) share a full bathroom. There is plenty of parking underneath the house as well as an adult picnic table, child's picnic table,grill, and outside shower with Hot water! This home is perfect for a family or two, or a couple that is looking for a nice affordable home, with great beach access. This home is situated that allows for privacy yet so close to the beach. NO SMOKING . NO PETS . NO House Parties. RENTS WEEKLY SATURDAY TO SATURDAY during the months of June, July, and August. Been going to Edisto for over 20 yrs. Per usual everything was amazing. This house fit the bill for a fun girls weekend. Gorgeous house and an amazing host. Would recommend 100%. Thank you for your kind words. We strive to provide a comfortable and affordable home that's just steps to the ocean. You were great guests and we would love to have you stay again soon.Thank you. Thank you and we hope you will come back soon. Amazing location and exceeded expectations! Our family thoroughly enjoyed our Edisto stay! The location was perfect and the outdoor area was spectacular! We are all excited to return as soon as possible! We certainly enjoyed our stay. The house is very clean and has plenty of room. We loved that the property is surrounded by trees giving us some privacy. The kitchen could use some updating and all of the TVs did not have cable or a DVD player with them, luckily we had our firestick, but that is not a deal breaker at all. We wouldn't hesitate to stay here again. Access to the beach was perfect considering we had our 4 month old with us, it made it super easy to run back to the house of needed and get all of our stuff down to the beach without a long hike. We would absolutely reccomend this place to someone. Thank you very much for your positive comments and we are so glad that you had an enjoyable time. Yes we agree, the property is unique in that it provides privacy yet just steps from the beach. Hope you will come again soon. We enjoyed staying at your home. Everything was clean and more supplies than we anticipated. The walk to beach was easy and quick. We liked it being tucked back on property, giving a bit more privacy. It was only the two of us, but anticipate returning to EBSC with family of 6-8 in future. Thanks for a great stay. Botany Bay Plantation is a must see! Weekend and daily rentals are available from September to March. Please inquire for special pricing and reduced cleaning rate for weekend/daily rates.